Wooden Compass Rose Model Sailboat 17"
Increased craftsmanship and significantly upgraded deck features highlight our newly redesigned Limited Edition model sailboats of America’s Cup winning racing yacht Intrepid. The second-ever back-to-back winner of the America’s Cup, the wind and waves will take you away with Intrepid in this Limited Edition yacht model. 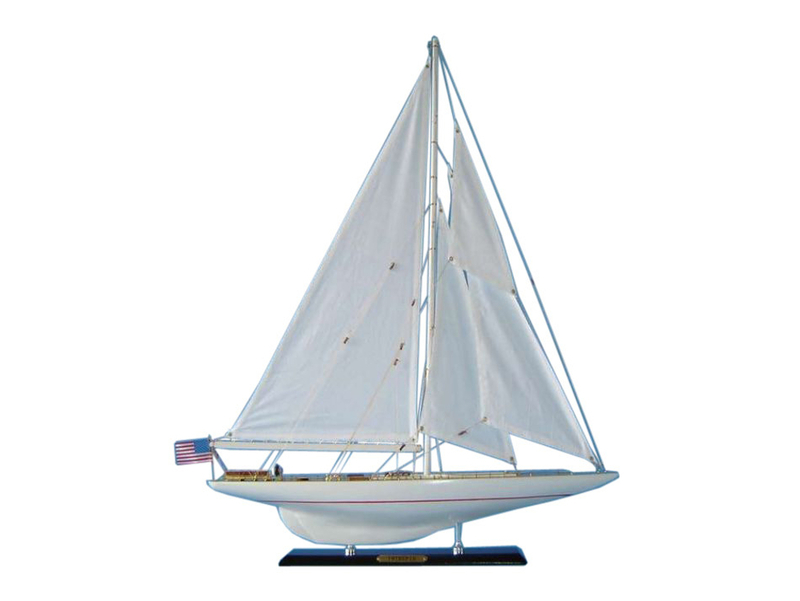 As a high-quality model with finely-crafted features and graceful lines, these Intrepid model sailboats are perfectly sized to suit a sunroom mantle, bedroom shelf or office desk. The Intrepid is a 12-meter class yacht which won the America's Cup in 1967 and again in 1970. Intrepid was designed by Olin Stephens, and was built of double-planked mahogany on white oak frames. She featured important innovations both above and below the waterline. The rudder was separated from the keel and a trim tab was added. This new general underbody type, with relatively minor refinements, was used on every subsequent Cup boat until the 12-meter Australia II's winged keel of 1983. Above decks, Intrepid featured a very low boom, made possible by locating the winches below decks. The low boom caused an "end-plate effect", making the mainsail more efficient. In 1967 Intrepid was skippered by Emil "Bus" Mosbacher, and defeated Australian challenger Dame Pattie. Redesigned in 1970 by Britton Chance Jr. and well captained by Bill Ficker that year, she defeated another Australian challenger, Gretel II. Intrepid remained competitive even against aluminum 12-meter yachts. Redesigned again, this time by her original designer Olin Stephens, the Intrepid was back again for a third time in 1974, captained by Gerry Driscoll. Intrepid came within one race of becoming the only three time America's Cup defender in history, but lost the final race of the defender trials to the Courageous, which would go on to win the Cup that year with Ted Hood at the helm. Ted Hood sold Courageous to Ted Turner who went on to win the 1977 America's Cup with her. 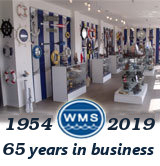 The Intrepid underwent a two-year structural restoration, the bustle area was reframed, the bottom replanked for several feet up from the keel, and the deck and deck beams were replaced. Today the Intrepid is available for charter out of Newport, Rhode Island along with fellow America's Cup winners Freedom and Weatherly.